Brendan Rodgers has made the uncomfortable journey from sitting on Liverpool's team bus as it received a guard of honour through Anfield's Shankly Gates from thousands of fans to admitting he was favourite for the sack inside six months. If anyone can be used as an accurate measure of the Premier League's skewed level of expectation, it is the Northern Irishman, who was three games from delivering Liverpool's first title for 25 years in May only to find himself under intense pressure at the end of November. Rodgers, to his credit, has not dodged the forensic examination his methods have received this season - but his outpouring of joy as Glen Johnson's 85th-minute header gave Liverpool a 1-0 win against Stoke City at Anfield hinted at sheer relief as well as elation. It ended a week that started with a dreadful performance in defeat at Crystal Palace - a third successive Premier League loss in a spell that has left Liverpool's Champions League aspirations on the edge. Rodgers has lived out every emotion of the Premier League manager in the past seven days, concluding it with a broad smile and the hope Liverpool, so dazzling in finishing runners-up last season, can now move their season forward. So this was the week that was for Brendan Rodgers. 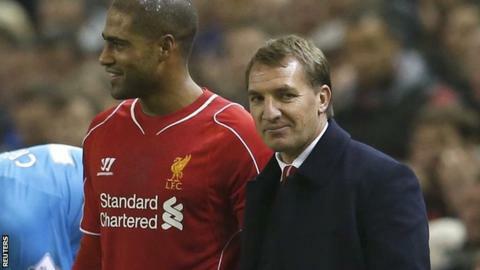 Rodgers will be in no hurry to see Selhurst Park again. If the 3-3 draw that contributed to their late Premier League stumble last season was bad enough, the manner of the loss last Sunday was arguably even more disturbing, and the catalyst for questions about his future. Despite taking the lead through Rickie Lambert's goal, Liverpool's lack of resolve and leadership after Dwight Gayle's equaliser was alarming. Former Reds defender Jamie Carragher was scathing as he accused Liverpool of lacking leadership and being "bullied and weak". Monday came with word from inside Anfield that there was no immediate pressure on Rodgers's position - surely the correct course of action given what he had almost delivered not so long before. The prizes on offer, not least financially, and the penalties for defeat inevitably apply pressure more prematurely, but the idea of Rodgers being anywhere near losing his job at this stage of the season - barring a meltdown of epic proportions - would rank close to knee-jerk. If producing the sort of football Liverpool did under Rodgers last season, so much inspired by the departed Luis Suarez, cannot put credit in the bank then it is hard to know what will. Apart from trophies, of course. It seems the Fenway Sports Group is holding its nerve. And rightly so. Former Liverpool goalkeeper Bruce Grobbelaar joined the debate, with verbal shots fired in the direction of Rodgers and his struggling Belgian goalkeeper Simon Mignolet. Ahead of the Champions League game with Ludogorets in Bulgaria, Grobbelaar's verdict on Rodgers was: "If he doesn't do anything in another three weeks, I think the owners could do something about it." Not exactly balm for morale and confidence but flying in the face of the messages coming from the club. If Rodgers thought this was harsh, he was almost showered with praise compared to Mignolet, who was on the receiving end of unequivocal criticism from one of his predecessors. "I was slaughtered last year by Liverpool fans saying I was too harsh on him," said Grobbelaar. "I'm not being too harsh on him. Not at all. "I likened him as worse than Dracula because at least Dracula comes out of his coffin every now and then. He seems to stay on his line and that's it." At least it was a twist on goalkeepers being called Dracula because they were afraid of crosses. Quite how Grobbelaar would have reacted at being rinsed so publicly by one of his predecessors is anyone's guess (very badly would be most people's guess) but things would get worse for the Belgian before they got better. There was a measure of vindication for Grobbelaar when Mignolet fumbled for Ludogorets' opening goal, and Liverpool's deficiencies at set-pieces saw them concede a late equaliser, but goals in between from Lambert and Jordan Henderson saw the Reds earn a 2-2 draw. Not a glorious chapter in Liverpool's European history but the rot was stopped and defeat would only have tightened the pressure valve still further. Rodgers and his players returned from Bulgaria and were able to assess a Champions League position that almost ranks as a best-case scenario from a series of largely undistinguished performances in Europe this season. Away defeats by Basel and Real Madrid, a narrow win at home and a draw at Ludogorets and a heavy home beating against the holders - and yet they have their Champions League future in their own hands going into the final group game against the Swiss at Anfield. As they and the likes of Manchester United have found in the past, Basel do not respect the Premier League reputation, but a win at Anfield in front of The Kop on 9 December will put Liverpool into the knockout phase. More than they deserve? Maybe. Settle for it? Definitely. Logic suggests the idea of Rodgers losing his job so soon after nearly winning the league is ludicrous, but he accepts the risks involved with Premier League management. Ahead of Saturday's game with Stoke City he said: "A few months ago I was manager of the year, now I'm favourite to get the sack. It's part and parcel of this wonderful life of working in football." Rodgers was actually third-favourite with most bookmakers but his admission was a stark reminder that victory is the only medicine that can treat the pressure inflicted on a Premier League manager. The front cover of Liverpool's match programme was adorned with 11 pictures of captain Steven Gerrard and the words "16 sensational years", celebrating the anniversary of his first-team debut as a substitute against Blackburn Rovers at Anfield. So it was not perfect timing that Rodgers chose to drop Gerrard to the bench, admitting later he had been unaware this was a landmark day for the 34-year-old. It was telling, and a sign that more must come from Liverpool's summer signings, that £87m worth of those purchases sat alongside Gerrard in the shape of Dejan Lovren (£20m), Alberto Moreno (£12), Emre Can (£10m), Adam Lallana (£25m) and Lazar Markovic (£20m). It was an indictment of the club's summer transfer policy, and the lack of impact the players have made since arriving at Anfield following the £75m sale of Suarez to Barcelona. With the game goalless after 75 minutes and Liverpool searching for a breakthrough, who did Rodgers call on? Yes, Gerrard. Victory over Stoke ended a run of four league games without a win - their worst run under Rodgers since a five-game winless streak in his first five games at the club. Defender Glen Johnson's goal was his first in the league since December 2012, ending a run of 58 league appearances without a goal. The roar of celebration and relief that rang around Anfield following the winner was an illustration of how important this victory was for Liverpool and their manager. Rodgers insisted Gerrard was left out with a nod to a busy schedule, but this may still be seen as an important moment - when he no longer counts as an automatic choice. He still has enough in his weaponry to make key contributions but the day has arrived when he requires careful management. As for Mignolet, he felt the frustration of Anfield when he was loudly ordered to speed up when taking goal-kicks, but he also produced two crucial saves from Stoke's Bojan Krkic, the second a flying, fingertip save deep into seven minutes of stoppage time from a brilliant volley. So at the end of a week of turmoil, the keeper left Anfield with a smile and Rodgers, at least for now, will be free of questions about the security of his job. It is surely no more than he deserves after the rapid progress of last season.